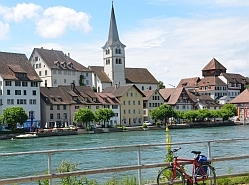 is located in Konstanz (3 nights); Überlingen; Nonnenhorn / Lindau; Höchst / Rorschach / Arbon and Schaffhausen. Selected properties include nights in 3 star hotels and in unrated, but very comfortable and well located accommodations. We are pleased to discuss details on request. The university town of Konstanz, Stein am Rhein’s Hohenklingen castle, the vineyards of historic Meersburg , the island town of Lindau and of course, the famous Rhine Falls – magnificent highlights of a tour around Upper and Lower Lake Constance which brings together great gentle cycling along lakeshore cycle paths and roads with so many countries, cultural influences and places to visit. 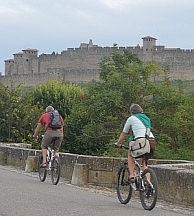 This tour includes ferry crossings (for you and your bike), a boat trip and admission to attractions as stated. Arrive in the university city of Konstanz – the biggest settlement on the shores of the lake set beside the mouth of the famous River Rhine. 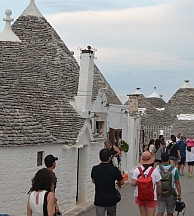 Take time to wander through the old town. 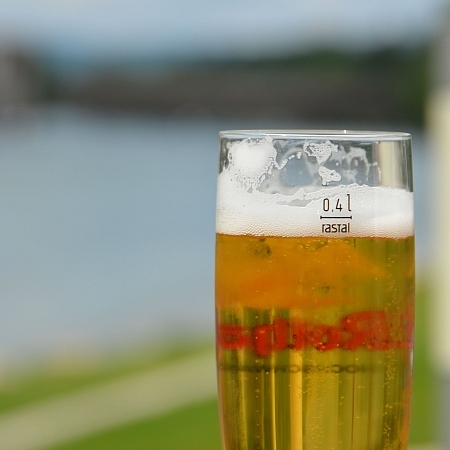 Head out to visit the island of Mainau, or simply sit and soak up the cosmopolitan atmosphere on the café terrace. Overnight in Konstanz. 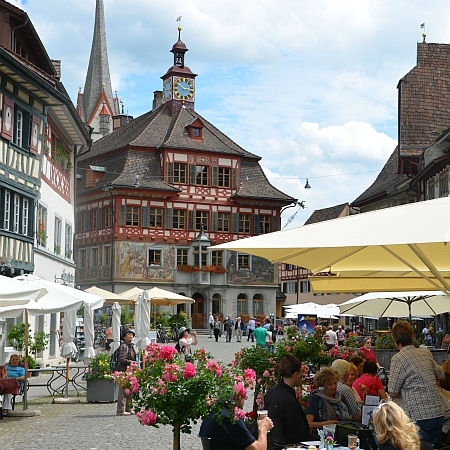 Head out north-westwards from Konstanz along the shores of the ‘Gnadensee’ to Radolfzell, a former imperial town which is now a popular spa resort. Rest up a while perhaps before embarking on the short gentle incline up the ‘Bodenanrück’ hills which will then deliver you down - with wonderful views! 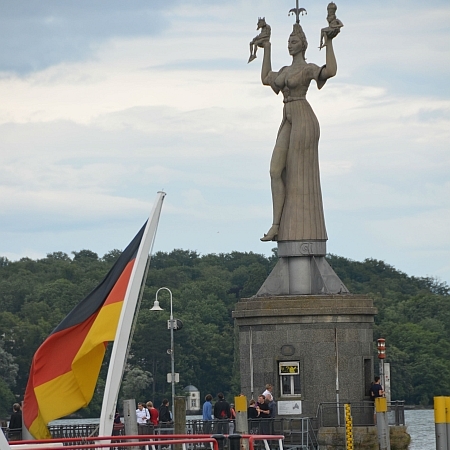 - to the part of Lake Constance known as the Überlinger See. Enjoy the historic ramparts, towers and colourful streets of spa resort Überlingen before your first overnight here in Germany. Once last chance to see the beautiful painted houses of Überlingen before your two wheels take you past vineyard slopes to the exuberant Baroque beauty of Birnau’s monastery church – a place of pilgrimage for centuries. 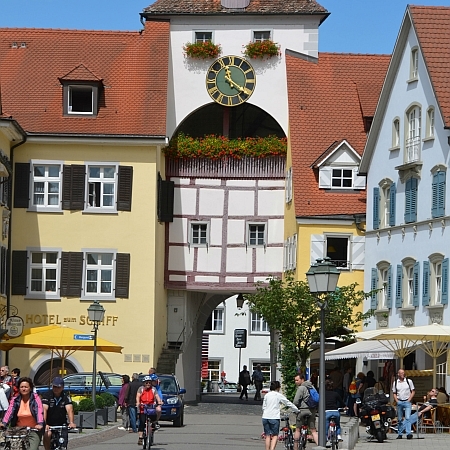 Next up, Uhldingen has interesting recreations of stilt houses down by the lake and Meersburg boasts two solid castles rising out of the trees in the heart of the historic town. 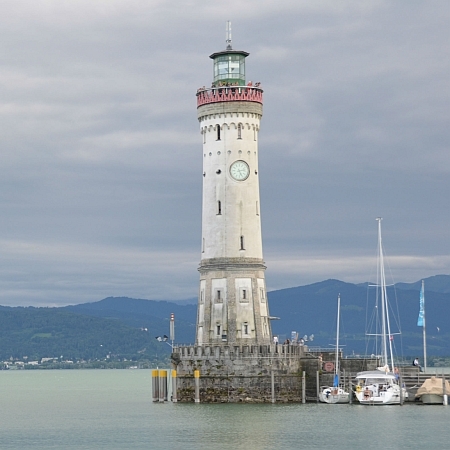 Still hugging the ‘Bodensee’ through Immenstaad, you reach the busy harbour of Friedrichshafen, home to the fascinating Zeppelin airship museum before arriving at Nonnenhorn / Lindau for your next overnight. Time to pay homage to the marble Bavarian lions which guard the harbor at Lindau and perhaps enjoy a coffee on the terrace of this delightful half-timbered, floral town before you leave Germany for the Austrian border and arrive in Bregenz, the proud capital of Vorarlberg. Look out for the famous stage on the lake which sees the most stunning theatrical performances or take the cable car to the top of the Pfander mountain for some breath-taking panoramas. 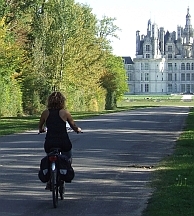 A gentle stretch of cycling through the nature reserves of the Rhine delta lead round into Switzerland, to Höchst, Rorschach or Arbon where you will spend your next night. From the decorated buildings of Rorschach or the half-timbered beauty of Arbon, your gentle adventure leads along the lake to the waterside gardens of Romanshorn and its harbour bobbing with private boats. Don’t miss the Seeburg Park at Kreuzlingen, the 2.5 mile stretch of lakeside gardens complete with castle, of course. Then it’s time to hop back into Germany and the city of Konstanz for your next overnight. Follow the side the side of Lake Constance, pedaling off to the almost completely intact medieval town of Stein am Rhein, famed for its frescoed houses. 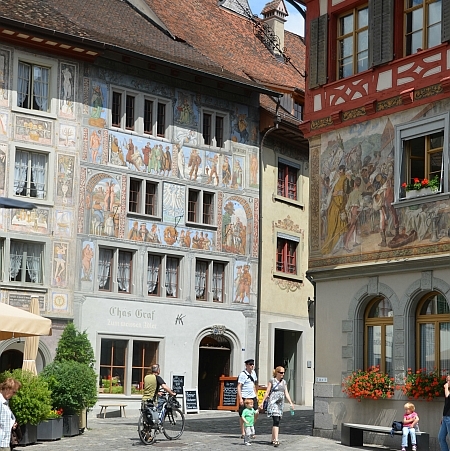 From here, enjoy a bit of border hopping as you crisscross your way between Germany and Switzerland to reach Schaffhausen, the capital of the Swiss canton. 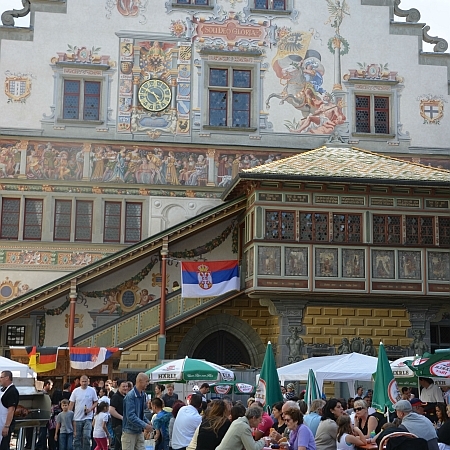 Sit and sip a coffee on the café terrace, looking up at the much-admired soaring gables of the town’s shops and houses – a tribute to local one-upmanship and competitive spirit of rich citizens in days gone by. 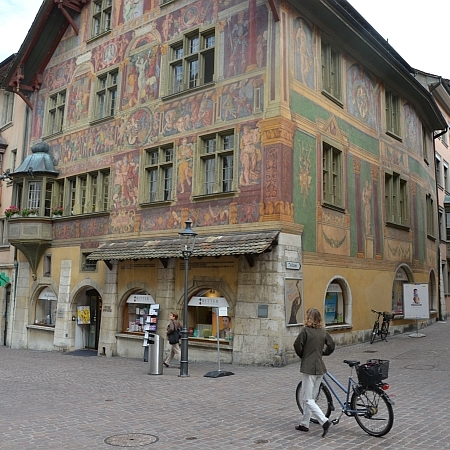 Schaffhausen, the town in the shadow of the impressive Munot fortress, is a splendid spot for your next overnight. Today, the largest waterfall in Central Europe awaits you – just a short cycle ride away. 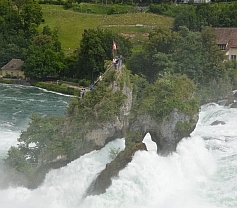 There’s a boat trip too (included in the tour price) as it’s a great way to see the Rheinfall rocks and experience the force of the waterfall for yourself. 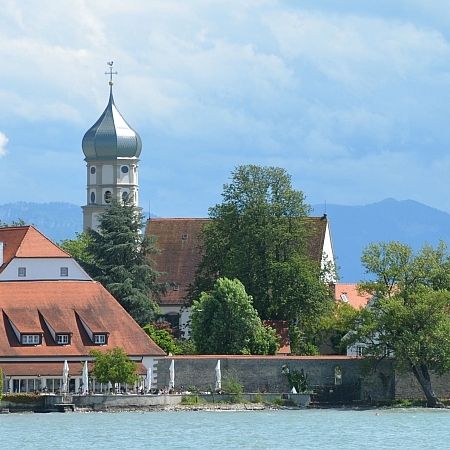 Pedal back via Stein am Rhein to follow the Höri peninsular next round to Gaienhofen, where a boat (included in tour price) brings you across to the World Heritage Site of Reichenau Island. A land of vegetables and vineyards, this idyllic spot is famed for its monastery and its churches which date from the 9th – 11th centuries. 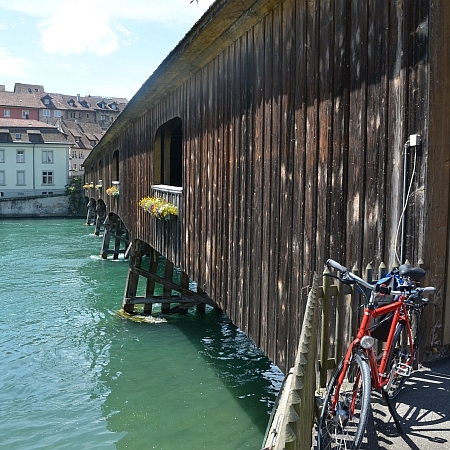 At the end of the day, it’s only a short cycle ride back to the buzz of Konstanz for your final overnight. Extra nights can be booked to allow more time to explore the cities and shores of Lake Constance at your leisure. Boat trip to the Rhein Falls rock.